AWS Documentation » Amazon Mobile Analytics » User Guide » What Is Amazon Mobile Analytics? What Is Amazon Mobile Analytics? Amazon Mobile Analytics is a service for collecting, visualizing, understanding, and extracting app usage data at scale. Mobile Analytics easily captures both standard device data and custom events and automatically calculates reports on your behalf. In addition to these aggregated reports, you can also set up your data to be exported automatically to Amazon Redshift and Amazon S3 for further analysis. For more information, see Auto Export. Overview – Track nine preselected reports in a simple-to-review dashboard to get a quick idea of engagement: MAU, DAU, New Users, Daily Sessions, Sticky Factor, 1-Day Retention, ARPDAU, Daily Paying Users, ARPPDAU. Active Users – Track how many users engage with your app daily and monthly and monitor its stickiness to gauge engagement, appeal, and monetization. Sessions – Track how often your app is used on a given day and how often each user opens your app during a day. Retention – Track the rate at which customers come back to your app on a daily and weekly basis. Revenue – Track in-app revenue trends to identify areas for monetization improvement. Custom events – Track custom, defined user actions specific to your app. Mobile Analytics can be used by developers to capture information, through analytics events created in the application logic, about how their applications are used. Individual bits of data called attributes and metrics are added to an event created in the application. After attributes or metrics have been added, the event is then recorded so a copy of the data is preserved in the device's file storage. When an application is sent to the background by the user, recorded events are then submitted to the Mobile Analytics service; this data contributes to the reports available in the console. 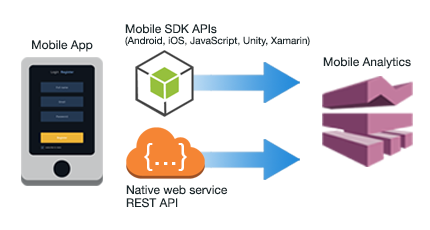 The Mobile Analytics web service provides a REST API your app can invoke using HTTP PUT requests. The REST API is platform- and language-independent; it requires a properly formed HTTP request only. With AWS services, you pay only for what you use, with no contracts or monthly active user charges. Mobile Analytics is free up to 100 million events per month, and costs just $1.00 per million events above the free tier. If you enable the Auto Export options to Amazon Simple Storage Service (Amazon S3) or Amazon Redshift (Amazon Redshift), there may be additional charges for the use of those services. If you use the Mobile SDK, Mobile Analytics automatically generates and submits two system events per session in addition to custom events you may create and submit. These events are required to enable collection of data compiled into the standard console charts on key performance indicators. If you use the REST API, you submit these system events (_system.start and _system.stop) manually. For more information, see Managing Sessions. Whether submitted automatically by the Mobile SDK or manually using the REST API, these system events are included in the count of total events submitted and therefore count toward the 100 million free events each month.